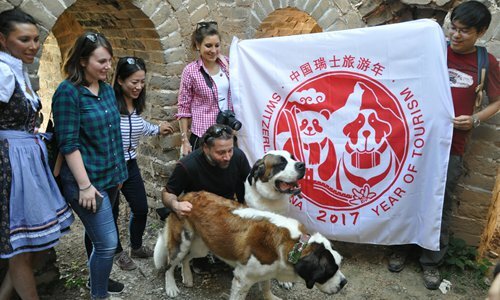 Two Saint Bernards toured the Xiangshuihu Great Wall in Beijing as a part of Switzerland-China Year of Tourism 2017 celebration recently. The Swiss dogs were in China for a two-week trip to help foster stronger ties between the two countries. During their stay, the dogs participated in several activities, including the World Winter Sports Expo 2017 from September 7 to 10, the Xiangshuihu Great Wall climb in Huairou district, greeting children at international schools and three public events in Shanghai. The brother and sister pair are named Apero and Bricotine. One is three years old, and the other is two. The dogs are owned by a Swiss couple named David and Rachel Luthi, who accompanied the animals to China. Talking about what Saint Bernards mean to the Swiss, Sonja Astfalck, economic advisor at the Swiss Embassy in Beijing, said it is difficult to explain what they represent to people of Switzerland. "It's really like the Chinese panda to the Chinese people," she said. "The dogs are our national icon." The tour group, including the dogs, traveled by car for two hours to a local villager's place not far from the Great Wall where they ate before the climb. David Luthi and representatives from the Swiss Embassy in Beijing prepared a Swiss cheese hotpot, and local villagers prepared Chinese dishes. During the climb, the dogs showed their true capability as mountain dogs, often going way ahead of their human companions. Able to withstand extreme cold, Saint Bernards were bred for mountain search and rescue in Switzerland. Rachel Luthi said that the climb was the best part for them too because it gave her and her husband another view of China. "We would probably come back to China, she said. "There is a lot to see in China." The trip was her first visit to the Chinese mainland. In explaining why they brought the dogs to the Great Wall, Florence Weber, a project assistant involved in the Switzerland China Year of Tourism 2017, said that they wanted to engage Chinese with Swiss values and spirit. "We think that bringing these dogs to China is a good way to meet Chinese people and to have an emotional connection, better than with any objects we could bring here," she said. "The dogs are something we think can represent Switzerland's values. That is why we came here to meet these Chinese people who live close to nature as we do in Switzerland."